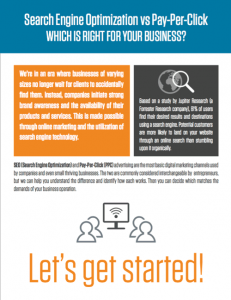 PPC vs SEO, Which is right for your business? We’re in an era where businesses of varying sizes no longer wait for clients to accidentally find them. Instead, companies initiate strong brand awareness and the availability of their products and services. This is made possible through online marketing and the utilization of search engine technology. Based on a study by Jupiter Research (a Forrester Research company), 81% of users find their desired results and destinations using a search engine. Potential customers are more likely to land on your website through an online search than stumbling upon it organically. If you would like to get started immediately, request more information from our contact page. In the meantime, complete the form to download our whitepaper.